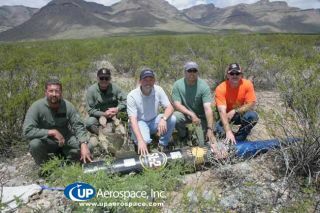 ost and found: A pleased recovery crew at New Mexico poses at the landing site of SpaceLoft XL hardware. The rocket section was hard to find after its April 28 launch , with repeat helicopter searches in mountain terrain coming up empty-handed. On May 18, the payload section was found in a clearing. From left to right: Bobby Bixter (Flight Engineer), Roger Bodwell (Pilot), Jerry Larson (President UP Aerospace), Ed Levine (Merlin Systems, Inc.), and Todd Miller (White Sands Missile Range). Thepayload container carrying experiments and the cremated ashes of some 200dearly departed people ? a cargo that includes remains of the beloved ?Scotty?of ?Star Trek? fame ? has been recovered in the New Mexico mountains. ?Ithas been found. It is in good shape,? Eric Knight, co-founder of the rocketfirm UP Aerospace that launched the cargo, told SPACE.com Friday. Thatpayload section UP Aerospace?s second SpaceLoft XL rocket landed in hard tosearch mountains within the White Sands Missile Range after blastingoff April 28th from New Mexico?s Spaceport America. The suborbital rocketshot the payload section up into space, with the booster stage and the topsection individually parachuting back down to terra firma. Tuckedaboard the rocket were a series of experiments and the ashes of 200 people,including actor James Doohan ? who portrayed the plucky Starship Enterpriseengineer Scotty on television?s ?Star Trek? ? as well as the remains of GordonCooper, one of NASA?s seven original Mercury astronauts. Repeatedsearches of a projected landing zone came up empty handedsince the rocket was launched. But today proved successful, with bad weather aswell as rough and tumble terrain making searches by helicopter tough duty. Inan earlier search, the rocket booster itself was found and recovered. Onthe scene as part of the recovery team, Jerry Larson, President of UPAerospace, reportedly found the missing in the mountain payload in good shape.More details regarding the finding of the rocket section are expected latertoday, Knight said. TheApril flight of the SpaceLoft XL ? labeled SL-2 ? tookinto space an array of educational investigations, as well as commercialand entrepreneurial payloads. Forinstance, 800 students from teams around the country and the world, includingAlaska, Puerto Rico, and the Netherlands, developed and designed 44 scientificexperiments for the SL-2 mission. TheSpaceLoft XL mission also marked the first Legacy Flight ? a new serviceprovided by Celestis Incorporated of Houston, Texas. That firm launches thecremated remains of individuals into space. UPAerospace is gearing up for future launches from Spaceport America, a sitedubbed as the world's first "purpose-built" ? or built from scratch ?commercial spaceport being erected 30 miles (48 kilometers) east of Truth orConsequences and 45 miles (72 kilometers) north of Las Cruces, New Mexico. Thiswas the second rocket liftoff for UP Aerospace from SpaceportAmerica. LastSeptember, the firm's SpaceLoft XL ran into trouble during ascent then fellto Earth after 90 seconds of flight. Corrective actions were taken by UPAerospace leading to the successful takeoff and full mission last month.